The last siege of Newark was much more serious than either of the previous ones. 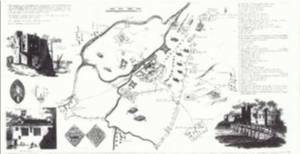 According to A.C. Wood, the besiegers reached Balderton and Winthorpe in late December 1645, and from then until May 8th, 1646, Newark withstood a constant siege. The arrangement of the forces is clearly seen on contemporary plans and drawings by Richard Clampe, an engineer on the parliamentary side. Colonel Rossiter at Balderton and General Poyntz at Farndon were watched by the Newarkers who were established in the fortification known as the Queen's Sconce. Colonel Theophilus Gray at Coddington and Colonel Henry Gray at Winthorpe were watched by the Newarkers who garrisoned the King's Sconce. The Scots took up their position at Kelham and, occupying the "island" from Kelham to Muskham Bridge, completed the ring of besiegers. Two bridges of boats were built, one at Muskham and the other from the Winthorpe side at Crankley Point, (Kelham Bridge and Muskham Bridge had been destroyed) and Col. Henry Gray set up a fortification to protect the Crankley Point Bridge on the Winthorpe side. The River Trent received much attention from both sides during the civil wars, the Roundheads damming the river and turning it out of its course to deprive Newark of water, and the Royalists in their turn damming the river to hold it up, and fords were staked to hamper both sides in crossing. So much damage was done to the river, in fact, that after the war was over a petition (now the property of the Trent Navigation Board) was made by the Mayor and Corporation of Newark, that the Trent might be cleared of all obstructions to navigation which had been brought about by sunken boats and ruined fortifications, which obstructions were hampering trade. Clampe's engraving (of which an enlargement accompanies this account) shows Winthorpe church as a ruin, presumably the result of civil war damage. As can be seen from the article about the church in this Scrap-Book, at the Easter Visitation of 1639 the church was described as having an unsatisfactory pulpit, and the Thoroton Society Transactions of 1961 point out that this would hardly have been the only complaint if the church had then been in a ruinous condition. In 1888, when the Newark Advertiser reported on the consecration of the new church, it was stated by the reporter that when excavation took place during the demolition of the old church, the platform of a gun-emplacement was discovered, together with spent gunpowder and many skeletons which had been buried without coffins in a common grave. "Major General Poyntz continues his Quarters at Stoake; the Nottingham forces did keep their Guards in the Church, where unfortunately happened so great a fire, which took hold of the straw, that they could not quench it until it had devoured all that was combustible by the fire, and nothing on the next morning remaining, a sad spectacle to the beholders; whether this gave any encourage­ment to the Enemy in Newarke we cannot tell." There was probably much skirmishing in the area between Winthorpe and Newark and R.F. Sketchley, writing in 1859, mentions one man, William Holles, who "commanded 200 soldiers on the Royalist side in the Civil War and was an accomplished youth," who was killed in a skirmish near Newark and buried in Winthorpe Church. Unfortunately Mr. Sketchley does not give his source for this information. Archdeacon West, now Bishop of Truro, describes in his little book about Upton in the civil wars, how raiding parties broke out from Newark from time to time, avoiding the enemy lines, and went on foraging expeditions in the country villages for chickens and eggs, and food of any kind. Clampe's engraving shows the ruined church outside the edge of Winthorpe, which itself is shown as a tiny enclosure of simple rectangular houses, standing at the crossing of the Newark-Gainsborough and the Holme-Coddington roads. This latter road appears to follow, from Winthorpe, the line of the footpath across the park and then across the present airfield to Coddington. We are puzzled by the fact that Clampe's drawing, and the copy made by Buck in 1726 of a later Clampe drawing, do not show the Fosse-way, the road from Newark to Lincoln; all the symbols which show detachments of men are following the Gainsborough road between Winthorpe and Newark, and of the Lincoln road there is no sign at all. However, we realise that at the time and well into the eighteenth century, all roads were little more than rough cart-tracks, and many of the old Roman roads had in places disappeared. An act of 1555 had made each parish responsible for supplying labour and materials for the repair and maintenance of its own roads, and standards were often very low, as A.C. Wood points out, "at least upon the trunk roads which did not serve the immediate needs of the parishes across which they ran." It may be, therefore, that during the time of the civil wars the Lincoln Road between Newark and Brough was in too poor a condition to be used by troops. 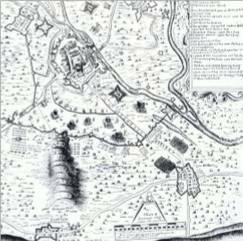 It is interesting that Clampe's drawing shows, in addition to tiny drawings of detachments of soldiers, cattle and sheep in the open fields and men ploughing, and there is in the key to the map a note pointing out "The Kine and sheepe feeding every where about the line the owners of which afermed they never received during the sledge any loss or damage In any of them in the least." According to the 1964 edition of the Newark-on-Trent Civil War Siegeworks, there were between Winthorpe Road and the river two segments of parliamentarian line, including Colonel Gray's Sconce and a redoubt, traces of which survived until 1950, by which time it was ploughed out. In 1960 the west part with the Sconce was destroyed when the sewage works was constructed; however, traces of the line can be seen in air photographs. "1646. Richard Thorneton, labourer, was killed with the fall of a stone at the pulling down of Newark Castle, was buried." Without doubt there must have been men from Winthorpe who joined In the destruction of the castle or of the neighbouring Sconce. Towards the end of the eighteenth century and into the nineteenth century the national worries about war with France and possible invasion are reflected in a small way in the life of the village by records concerning the militia. Each parish, through the offices of the constable, had to provide men to serve in the militia, and the parish paid towards the support of his family; if through mitigating circumstances a substitute was found for any man, the family of the substitute also had to be supported by the parish during his year of service training. "To those it may concern be it remembered that we Jonathan Preston Constable of Langford in the County of Nottingham and Edmund Horner Constable of Winthorpe in the said County do agree to find a proper person to serve in the Militia for the said County.... and that I Jonathan Preston as Constable of Langford and I Edmund Homer do respectively agree to pay the Expence of pro­curing a Substitute for the aforementioned Parishes according to the proportion of Thirteen to Six those being the two Numbers of Men liable to serve in the said Militia the former number Thirteen for the said parish of Langford and the latter number Six for the said parish of Winthorpe as witness our Hands the Day and Year first above written. "To the Overseers of the Poor Winthorpe. I do hereby give you notice that William Walker substitute for your parish hath volunteered from the Nottinghamshire Regiment of Militia into his Majesty's Regular Forces and you will therefore cease paying any allowance unto his Family. Witness my Hand this 18th day of May 1809. Geo. Fox. Clerk of Subdivision"
At the end of the Napoleonic Wars there are many references in Winthorpe parish records (as there are in most parishes at the time) to ex-soldiers and sailors who were on the move across the country in search of work, e.g. It is not until the close of the nineteenth century, when the Rev. Clement W.H. Griffith was writing in the parish magazine, that we are able to see the way in which great national events affected the villagers. Miss Bellamy's father was a drummer-boy in the Boer War and there were other volunteers from the village. Mr. Griffith writes in early 1900, "On the first Sunday morning in the new year ... here as elsewhere a Humiliation Service of repentance and intercession for our national sins was held ... Special hymns for use in time of war have been introduced into our services ... (including)... ‘Father Forgive,' by Dean Hole, music by J. Stainer." A parish fund was started for Widows and Orphans of Soldiers and Sailors killed in the South African War, services of intercession continued to be held from time to time and there were occasional services of thanksgiving, as in May 1900, when "the National Anthem was played at Evensong and Thanksgiving Prayers were said as acts of praise for the Relief of Mafeking and other successes in South Africa." At the same time there is an entry in the village school logbook, which states that on May 25th "the school was closed to commemorate Mafeking Day." However, there is a sombre note about Mr. Griffith's comment on the end of the war in 1902. "The deadly, weary great Boer War over, the enemy surrendering in May's last moments, June's first gift in her first hour was the blessing of peace.... There was more of the moody feeling of relief that the war was done with, than the feeling of gratitude." The Rev. Mr. Griffith was still Rector of Winthorpe at the outbreak of war in August 1914, and almost immediately the villagers undertook various charitable schemes and generously supported national funds for Belgian Relief. As before, during the South African war, services of intercession were regularly held. In September of that year there came tragedy to the village, which had nothing to do with the world war but which cast a gloom over the entire community that older residents have all mentioned to us. Two young women, Miss Monica Oxenham and Miss Caroline Elizabeth Branston were drowned in the River Trent, having gone there to swim at the end of that long hot summer. Both had taken an active part in many aspects of village life and were well liked by everyone. Both were good swimmers but were swept away by strong, eddying currents; one of the Camamiles dived repeatedly in vain efforts to rescue them. The parish magazines during the early months of 1915 quoted extracts from letters written by young men from the trenches, describing the dreadful conditions in which they were fighting. In August of that year much prominence was given to suggestions from the Board of Agriculture and Fisheries that Village War Food Societies should be formed to cultivate wasteland and generally increase garden and fruit produce. Much more, it was urged, could be produced by the growing of vegetables, keeping goats, pigs, poultry, rabbits, pigeons and bees by gathering wild fruit, by gleaning and by collecting acorns, horse chestnuts and beech mast "which are useful food for stock." This last idea, at least, was enthusiastically taken up by Miss Gilstrap and Mr. Branston, who called at the school and organised expeditions of children to gather horsechestnuts from the grounds of Winthorpe House, The Grove, The Grange and Winthorpe Hall. There are regular entries in the school logbook during the autumn months up to 1917, reporting that the afternoon session closed early so that the children could go and collect chestnuts. During July 1915 Miss Gilstrap is reported to have visited the school to suggest that the boys might learn to make sandbags for use in the trenches and she would supply all the necessary materials. The head teacher adds, "The boys are very enthusiastic over the suggestion." No time was lost and by October 1st we read, "Today sandbag making ends. The boys have worked most wholeheartedly and are very sorry to stop. Seven boys have completed 24 bags." The children appear to have been kept closely in touch with the progress of the war from the very early days when the head teacher reported that she was "suspending the ordinary History and Geography lessons... in order that she may give some simple lessons on the cause, progress and areas affected by the present War." Lessons followed later on the Countries of our Allies, the life of Earl Roberts, and there was much learning of patriotic songs. Miss Gilstrap presented each child in the Upper Division with a War Savings Card and brought patriotic pictures to hang on the wall, lessons were given on "The National Scale of Voluntary Rations and the need of Food Economy," and as a follow up the older children were set to digging the school garden and setting potatoes. All along, the older girls had made garments suitable for Belgian Refugees and the troops. There is an account in one parish magazine of an entertainment, which was put on in the Village Hall in November 1917. This entertainment consisted of "songs, recitations and dialogues given by a band of our children in the Parish. They conceived the idea among themselves, selected the performers and managed the whole programme, but wisely invited Miss Eva Camamile to train them." They raised the sum of £3.2.0. for sending Christmas comforts to prisoners-of-war in Germany who came from this district. Twelve boxes were made up, each bearing the name of a soldier and the name and address of one performer. That the children of the village felt greatly involved with the war is made clear in the school logbooks, where we have the occasional reference to boys who played truant to go "to a Patriotic Fair in Newark" or to nine of the older children who arrived very late one morning. "An aeroplane that had dropped in a field at Langford was the only reason. They were retained in school and greatly reprimanded." On the other hand there were occasions when the older children were taken to Newark to see the soldiers arriving, and there is a note of patriotic pride in the entry for May 15th 1917, when the assistant teacher Miss Harrison was granted leave of absence "to spend the day with her soldier brother who is receiving a Distinguished Conduct Medal for bravery on the battlefield." Some of the older people in the village, however hard they worked for the war-effort and war charities, nevertheless felt that games of recreation were not appropriate to the times. In the Cricket Club minute books there is a reference in 1915 to a letter from Mr. J.G. Branston the president, saying that he did not approve of any matches being played that season, and that neither he nor his sons would subscribe. The club had hoped to keep going with friendly matches so that the ground would not run wild altogether, but in the end the idea was abandoned and the club did not meet again until 1922. The outbreak of World War II in 1939 brought two entirely new factors to war-time life in Winthorpe, one of which was the occupation by the services of many of the big village houses. Winthorpe Hall was already empty and it was immediately occupied by the R.A.S.C. who, however, quickly took steps to ensure that the house was cared for, by covering the wood­block floors and by ordering that only the back staircase should be used. Winthorpe House was taken over for officers of the A.T.S., and part of The Grange was occupied by A.T.S. other ranks, the remaining members of the Higgs family retreating to the top floor. Even the Village Hall was requisitioned and became for a time the Quartermaster's Store. As neigh­bouring Langford was occupied by R.E.M.E. the whole district must have seemed crowded with men and women in uniform. In a minor way the village school, too, was invaded, this time by a dozen evacuees from Yarmouth who were billeted with village families; but theirs was only a short stay of about a year. The second big change which war brought to Winthorpe and which was to quite irrevocably the appearance of the village, was the construction of an airfield on what had once been the ancient open fields of the village, and which more recently was Carr Farm, with its outbuildings and lodge, its enclosed fields and its plantations, stream and footpaths. There follows at the end of this account a detailed study of the airfield, which presents the technicalities; here may be found some of the recollections of those people who were living in the village at the time. The airfield was planned in 1939 and was constructed in two stages, the first half the section now occupied by the Newark & Notts. Agricultural Showground, and the second half the remainder as far as the present by-pass. In the construction Carr Farm and all its buildings were demolished, the stream was piped in and the ground levelled, and the airfield was opened. In September 1940, Two-mile House, which stood on the far side of the present Winthorpe roundabout, was demolished as it was a hazard to aircraft taking off, and later, after the dropping of a land-mine on the airfield, the Bleach Houses were also ordered to be demolished for the same reason. Strangely enough, apart from broken windows, the Bleach Houses suffered no damage when the land-mine was dropped, but scores of windows were shattered in Winthorpe and on the outskirts of Newark. Mr. Coupland and Mr. Euston both recall the heavy damage to the extensive glass-houses in the gardens of the big houses in Winthorpe, and the many barrow loads of broken glass that had to be swept up. The late Miss Olive Rippingale was an air-raid warden at the time, and on hearing the explosion rushed out across the park, leaving all the lights in her house blazing through uncurtained windows, to the horror of all the neighbours. During the war years there was a small centre established by Mrs. R. Spencer at Hillcrest where up to thirty women were employed in a minor branch of war work, trimming the flanges of rings used in the manufacture of aircraft. Some of the workers came from the village and others from the Winthorpe Road estate on the outskirts of Newark. After the end of the war, the War Agricultural Committee took back the airfield in about 1950, and Mr. J.M. Hounsfield became the first tenant in 1951, occupying what is known as South Airfield Farm. When the Newark Agricultural Show was revived, it began by renting ground from Mr. Hounsfield for its annual show. Then, throughout the late fifties and well into the sixties there were protracted negotiations between the interested parties and the authorities to buy the land from the original owners, who included the executors of the late Captain Need. At the same time, the Show Committee and Mr. Hounsfield made exchanges of parts of the land until now, the Newark & Notts. Agricultural Show has a permanent site at the Drove Lane end of the old airfield. It is interesting that Mr. Hounsfield is now (1971) gradually breaking up the former aircraft dispersal rings and the pieces of concrete are to be used in the foundation rubble for the Beckingham by-pass. Unfortunately It will take very many years before the soil of the old air-field will recover sufficiently to grow corn of the former quality. The airfield was opened in September 1940 as a satellite base for Swinderby, receiving its first aircraft a month later when 300 (Polish) and 301 (Polish) Squadrons each used Winthorpe as dispersal for three of their aircraft. These were originally Fairey Battles, but during November both units converted to the Wellington 1c. The Battles and Wellingtons carried the unit codes BH(300 sq) and GR(301 sq). On November 14th, the Luftwaffe dropped a single parachute mine on the air­field, leaving a crater 38 ft. across and 20 ft. deep. Two aircraft on the airfield at the time were undamaged. During 1941, the airfield continued, principally in a training role, until November when control passed to Ossington when flying ceased. On 7th February 1942 Win­thorpe became a second satellite of Syerston, but there was still no flying. On 15th October control returned to Swinderby, and on the last day of the year aircraft returned to Winthorpe in the form of its own unit, 1661 Heavy Conversion Unit, a 5 Group unit transferred from Waddington and Scampton with 8 Manchesters and 10 Lancasters. Some aircraft were coded GP and others KB. Up to autumn 1943 there were 10 crashes of 1661 HCU aircraft; a Manchester at Swinderby (on 19th May), a Lancaster at Balderton, and 8 Lancasters on the airfield itself, including one that was burnt out. During autumn, the Manchesters were replaced by Halifaxes, the last Manchester departing in October. However, by the end of the year the unit was operating Stirlings alone, 37 Stirling 111s received from operational units, e.g. 214 sq. who flew their aircraft from Chedborough to Swinderby, where they were collected by 1661 HCU. On November 3rd, 1944, control of 1661 HCU passed from 5 Grp. to 7 Grp. and the base H.Q. was renumbered from 51 to 75. Late in 1944 the unit began to revert to Lancaster 1s and 111s, but the last Stirling crew did not complete training until 4th February 1945. Three of these Lancasters were lost in crashes; 24th March at Langford, 16th April at Oxton and 25th May on the airfield itself. During 1944 a few Spitfires and Hurricanes were used for fighter affiliation. In August 1945 all the Lancasters were dispatched to other units, and 1661 HCU was disbanded on 10th September. Ten days later Transport Command took control of the air­field, but no use was made of it until February 1953, when the Central Servicing Development Establishment arrived from Wittering, without any aircraft on its strength, leaving for Swanton Morley in January 1958. The airfield was reduced to inactive status next July. Winthorpe has since been used sporadically by light aircraft, and is now the home of Newark Air Museum, who flew in Pervical Prentice G-AP1 from Andover on 8th July 1967, followed by Supermarine Swift FRS WK277, Avro Anson G-AL1H and Gloster Meteor FR9 VZ608, all brought in by road. A hangar is being built at the moment (April 1971). Winthorpe Airfield in Volume 3. The History of Winthorpe Airfield in Volume 3.